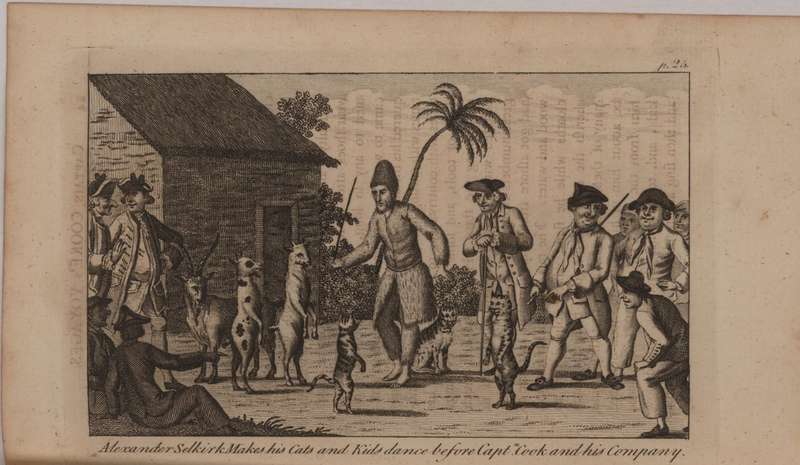 Alexander Selkirk Makes his Cats and Kids dance before Captn Cook and his Company, artist unknown, 1774, John Carter Brown Library. 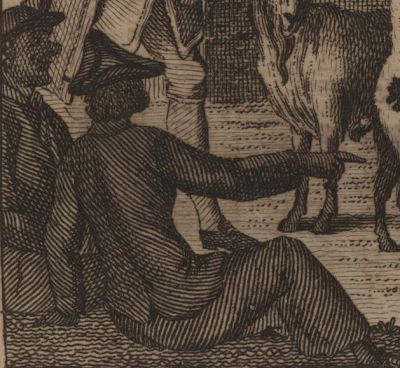 Drawn from the 1774 book An Historical account of all the voyages round the world, performed by English navigators..., this image shows the entertainment offered to Captain Cook and his crew by the famous castaway Alexander Selkirk. Selkirk's experiences would be fictionalized into the story of Robinson Crusoe by Daniel Defoe. Thankfully for us, the officers and crew are both included in this print. At the right of the frame, a few tars merrily enjoy the show. The most prominent are the two portly seamen who both wear reversed cocked hats. Each has a solid colored neckcloth tied about the neck. Interestingly, the sailor on the right wears a frock coat, long waistcoat with cutaway, and breeches. If not for his hat, short hair, neckcloth, and the stick, I would think he wasn't a sailor at all! 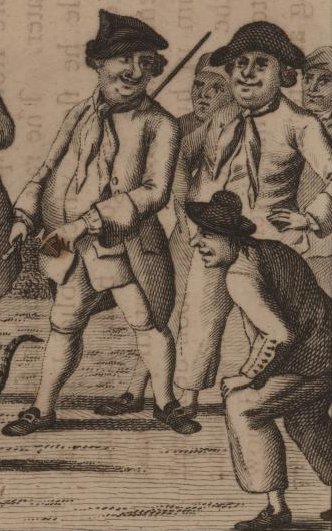 The fellow next to him is more traditional in his slop clothes: short jacket (albeit with cuffs) and trousers that end above the ankle. In the foreground is yet another mariner, this one in a round hat with a tall crown, a short jacket with buttoned mariner's cuffs, and a pair of trousers. On the left and in the dark foreground are two more tars. One wears a cocked hat with the point forward, a short jacket with buttoned mariner's cuffs and a single vent, and trousers. The other is dressed much the same, save for his jockey style cap. Interesting assortment of headgear in this piece. What is the earliest representation you have run across that depicts the practice of sailors wearing the name of their ship painted or sewn on their caps or cap ribbons? Now that I think about it, I've never come across that. That does not mean that I won't in the future, but of the 200 or so images that I've examined so far, I don't recall a single one that shows a sailor wearing the name of their ship.